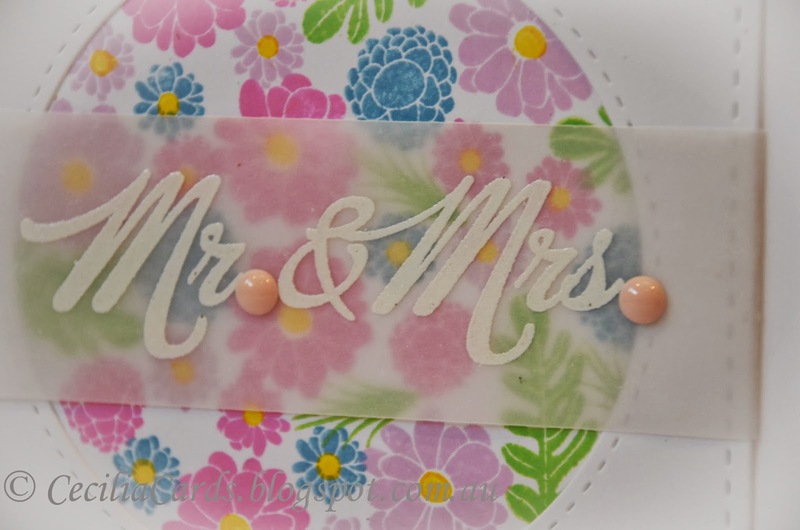 This is the second wedding card I made with a stampset I've had for a little while but it has not seen ink!! 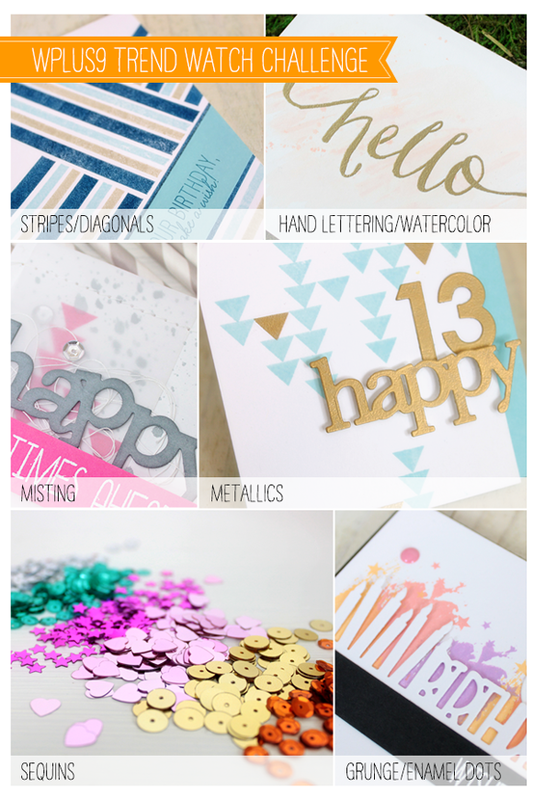 Here is the card and have fun with the PTI February Blog Hop today! Neenah cardstock, PTI Reasons to Smile and Big Bold Wishes, Hero Arts Bubble Gum, Passion Flower and Green Hills, Memento Luxe Sweet Plum, Versamark, Silver EP, Lil Inkers Stitched Squares. 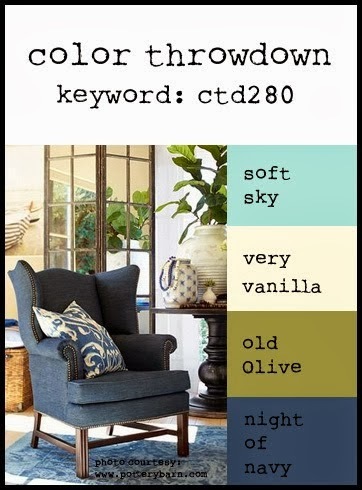 It feels so good to be able to participate in the PTI monthly blog hop again after a very busy month last month. 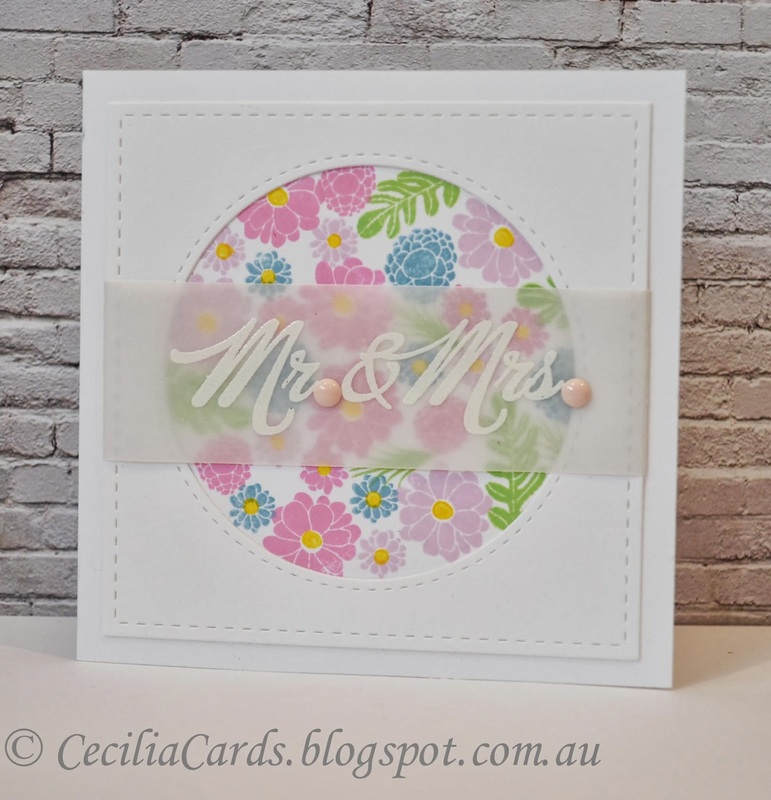 The theme for February is Spring which is perfect for a few wedding cards I need to make. 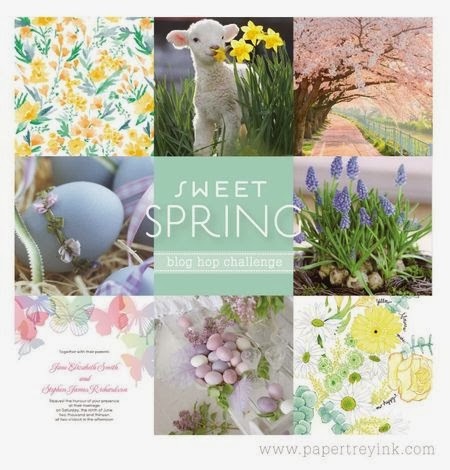 I've made two for the Blog Hop and here is the first one. It is so much easier to make a card for a female than a male! I have another farewell card for a work colleague and decided to go with the Paper Smooches Sparks Designer Drafts sketch. This sketch screams washi tape! I started off with some non-feminine colours and went from there. This card is another A4 sized card. 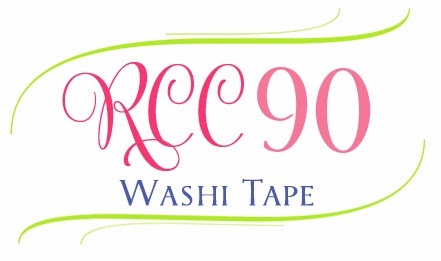 As I've used washi tape, I've also decided to add this to Ribbon Carousel's Washi tape challenge. Neenah carstock, PS note die, Reflections and Sentiment Sampler, Hero Arts Soft Granite, Cup O'Joe and Navy, Memento Luxe Bahamas Blue, washi tapes in my stash and MME enamel dots to match. It is sad at work when Voluntary Departure Packages are offered and quite often, some of our fellow colleagues who have been there for over 20 years take them. This week in our department at work, we say goodbye to 4 colleagues, some of whom I have worked closely with in the past. They are all leaving at the end of this week and there are lots of farewell lunches, afternoon teas and dinners. Well hey, guess what? I've been asked to make some of these cards. 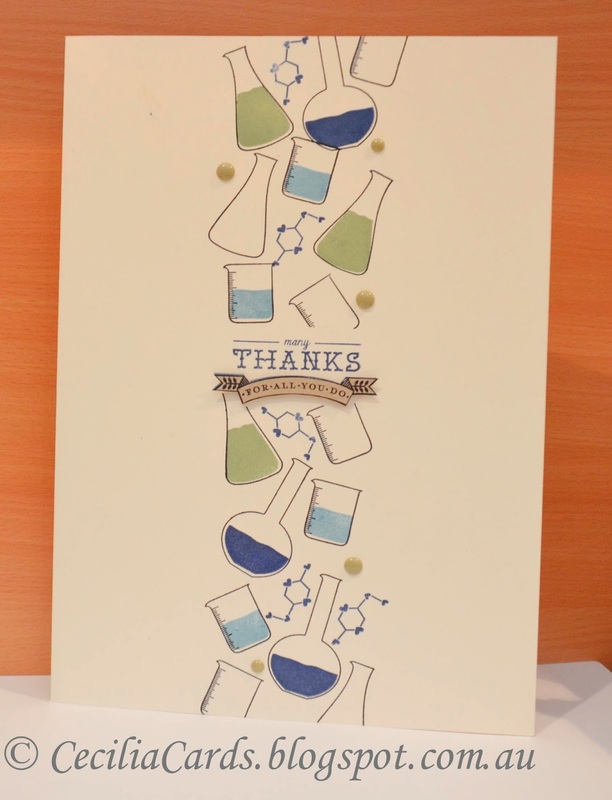 Here is one for a colleague I have worked with when I was in the laboratory three years ago. 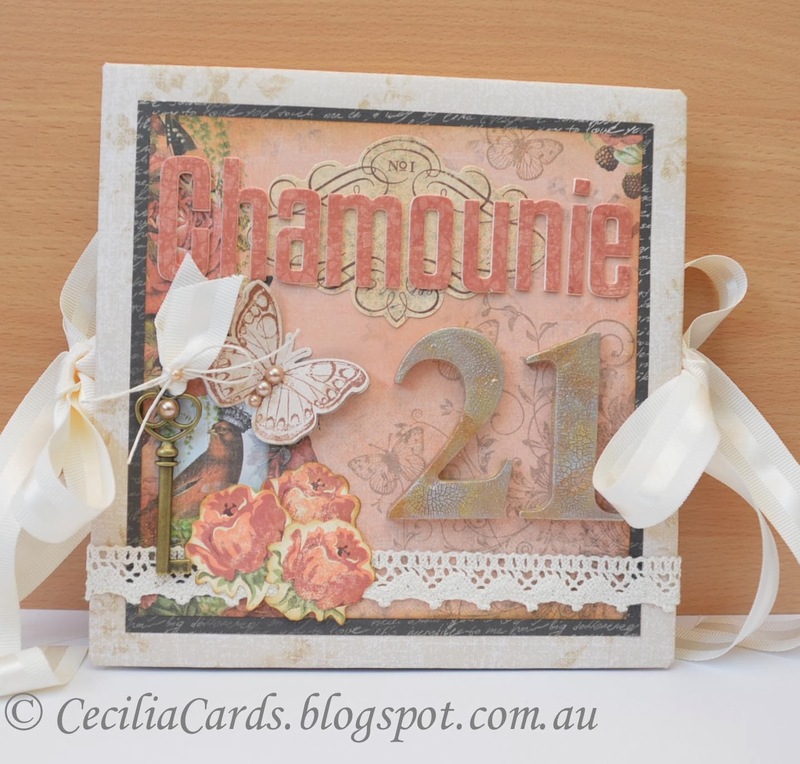 I used the colours of the current Color Throwdown #280, the vanilla being the cardstock colour and the PTI Love Potion stampset which was quite appropriate for my work! This card is A4 sized! 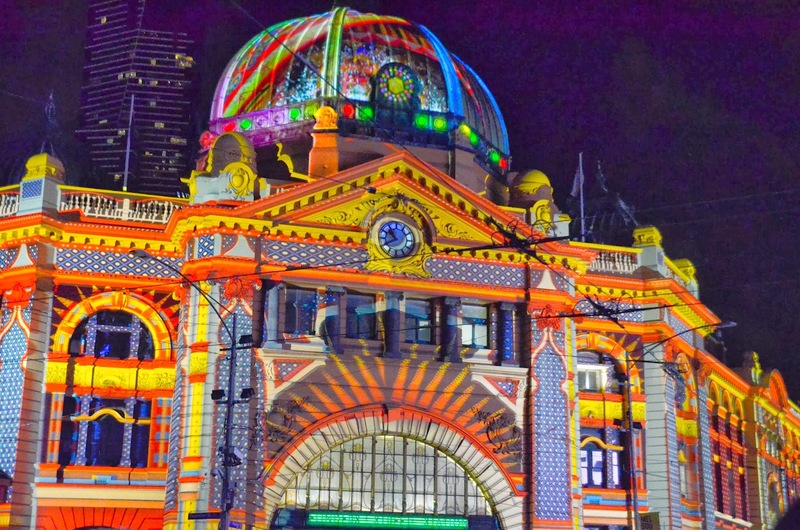 Thanks for popping by! Neenah cardstock, Papertrey Ink Love Potion and Folk Art, Hero Arts Pool, Green Hills and Navy, Ranger Archival Jet Black, My Minds Eyes Enamel dots. 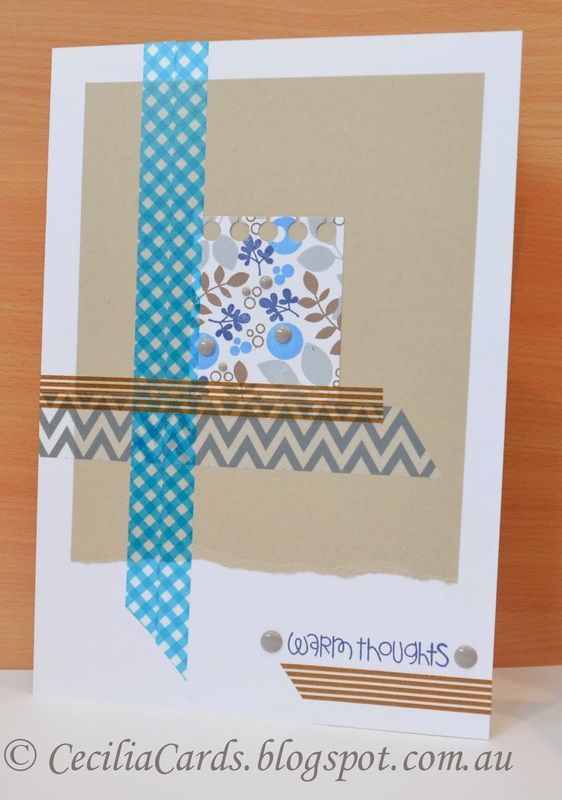 A quick card to share for the Paper Smooches Sparks Anything Goes challenge. 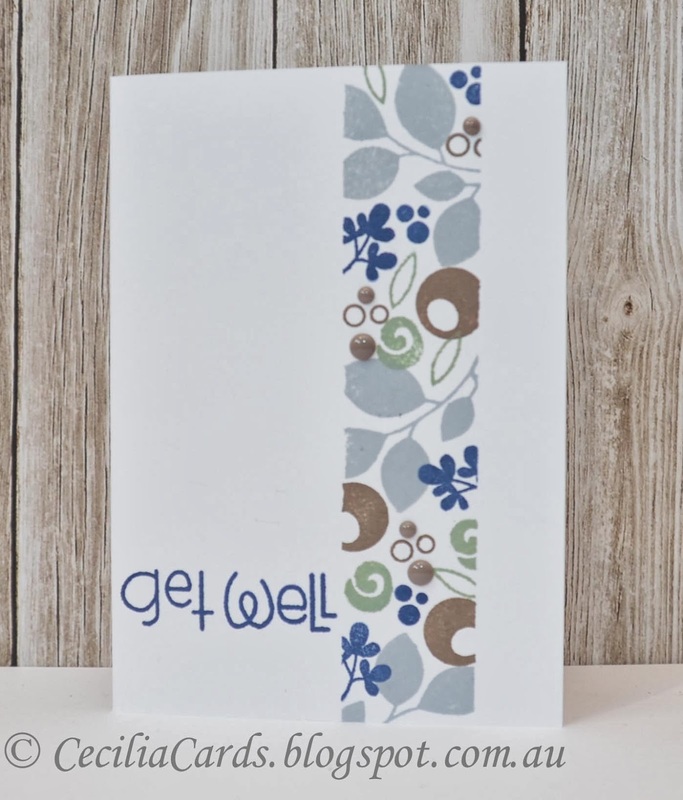 This is a masculine Get Well card made with PS Reflections and Sentiment Sampler. 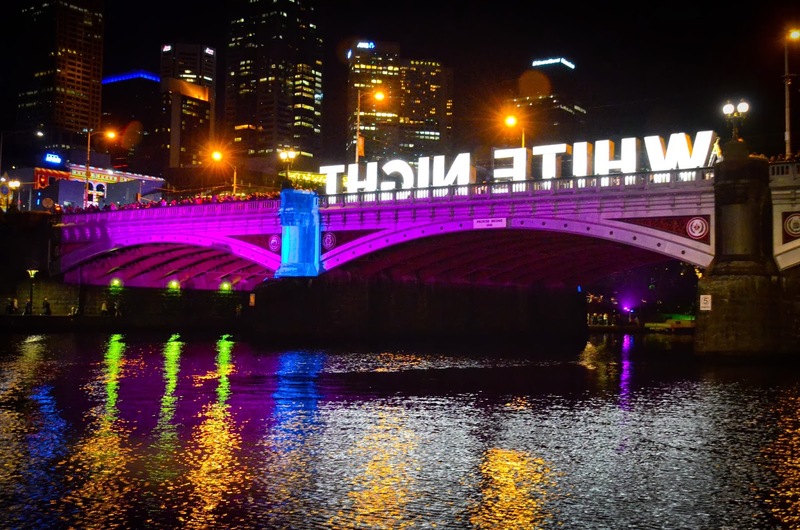 We had White Night in Melbourne last night, I would like to share some photos I took last night. 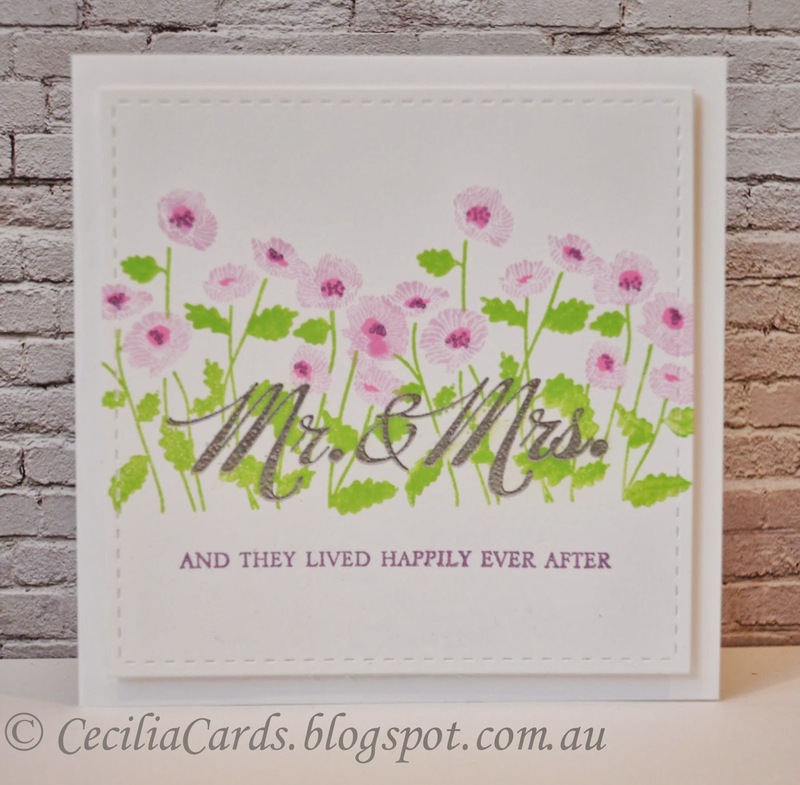 I had fun making this wedding card with WPlus9 Fresh Cut Florals. 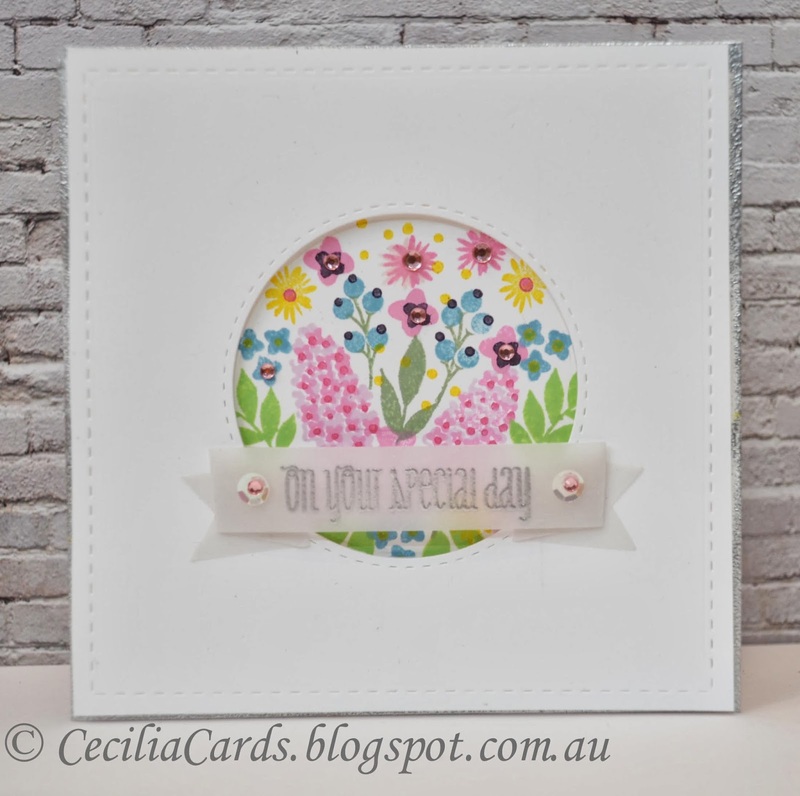 I just love the flexibility of this stamp set to create a scene. 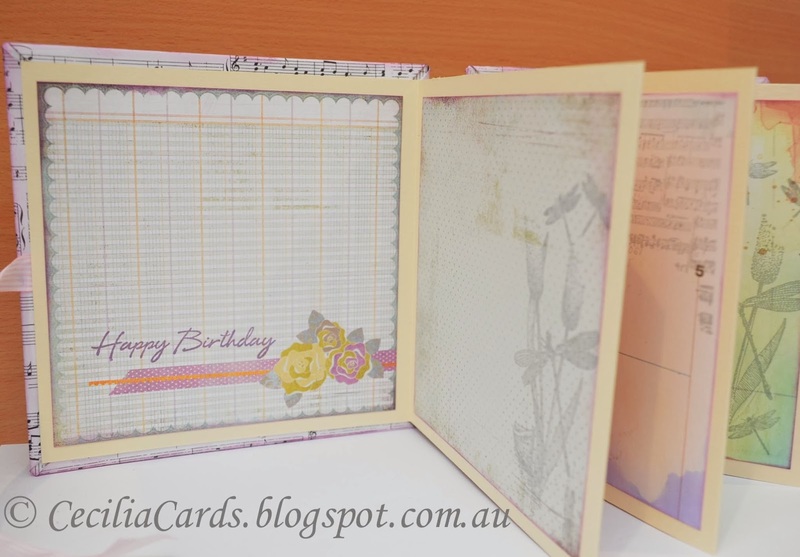 Here is my card for the WPlus9 Birthday Celebration - Trend Watch Challenge. Neenah cardstock, vellum, Lil Inkers Stitched Squares and Circles dies, Simon Says Stamp Banner die, WPlus9 Fresh Cut Florals, Versamark, Silver EP, sequins, Kaisercraft rhinestones. Inks - Hero Arts Pool, Green Hills, Field Greens, Passionflower and Bubble Gum, Memento Luxe Dandelion, Rose Bue and Elderberry. When I saw the Fusion #4 Challenge, I could not wait to start. I love butterflies! 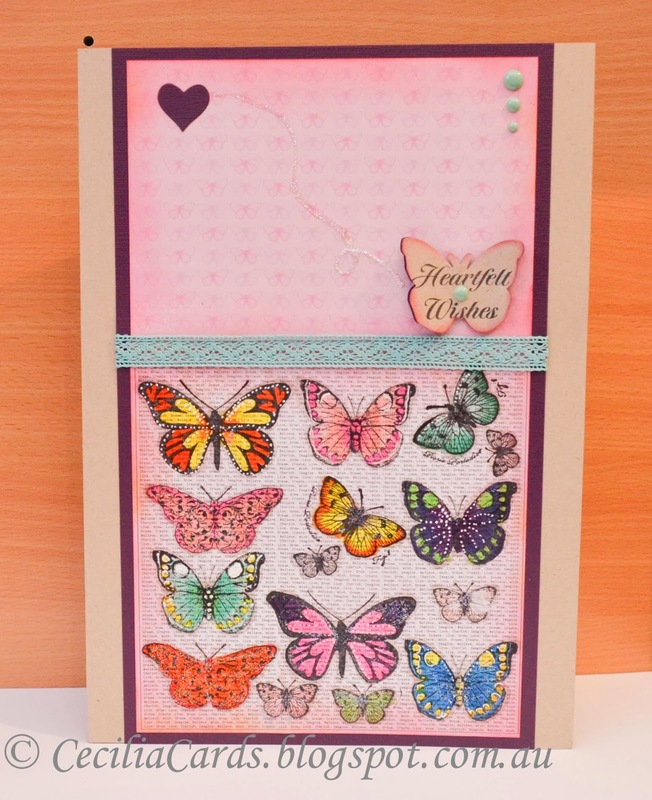 I gathered all the butterfly stamps I have and used them all for this card, except for the Tim Holtz one which did not quite fit in with what I wanted to do. 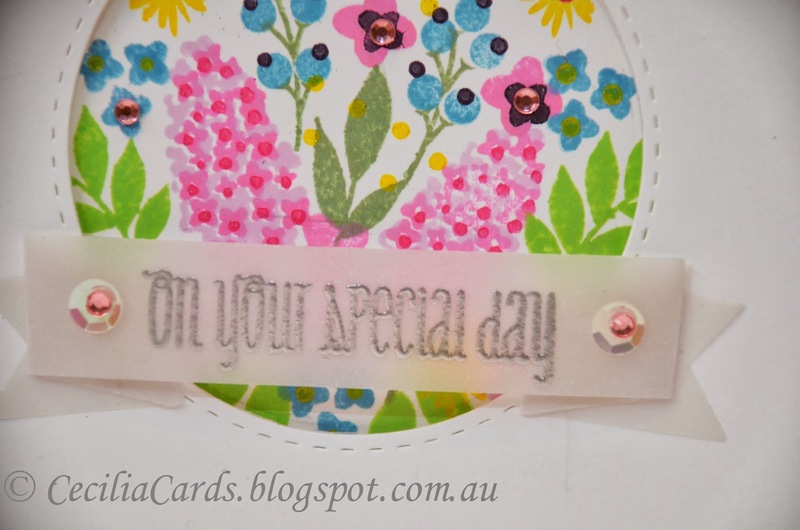 Initially I tried heat embossing with black but when I used my Copic markers, the black smudged! Boo! So I stamped with Memento Tuxedo Black ink, coloured with Copics and then added a bit of glitter.. This is an A4 sized farewell card for work. Thanks for dropping by! 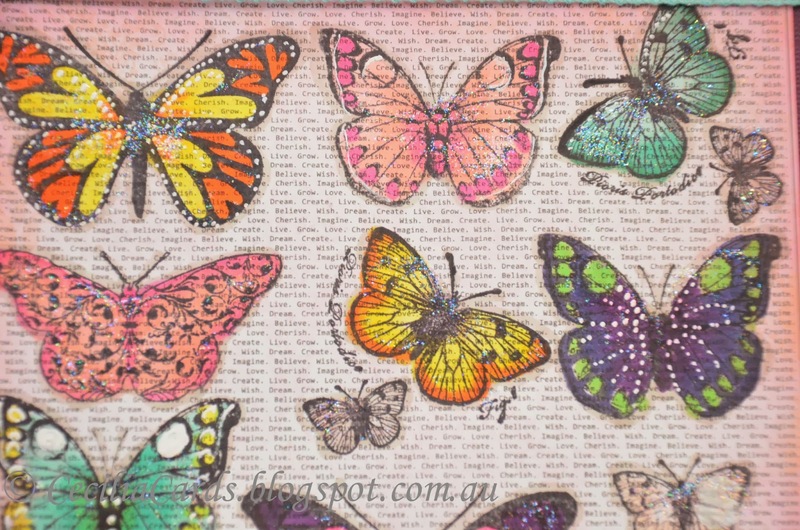 A close up of the colourful butterflies! Neenah and Core'Dinations card stock, Kaisercraft Tigerlilly, Hero Arts Heart Winged Butterfly, Antique Butterflies, Papillon and Say It All, Stamp-It Filigree Butterfly, Memento Tuxedo Black, Copic Markers, Distress Ink Worn Lipstick, Pink Paislee lace, MME enamel dots, Ranger stickles. Man, have I been busy with orders lately! So I have to keep the creative juices flowing! Here is another 21st album for a client. The client's brief was vintage with purple and dragon flies. Too easy? 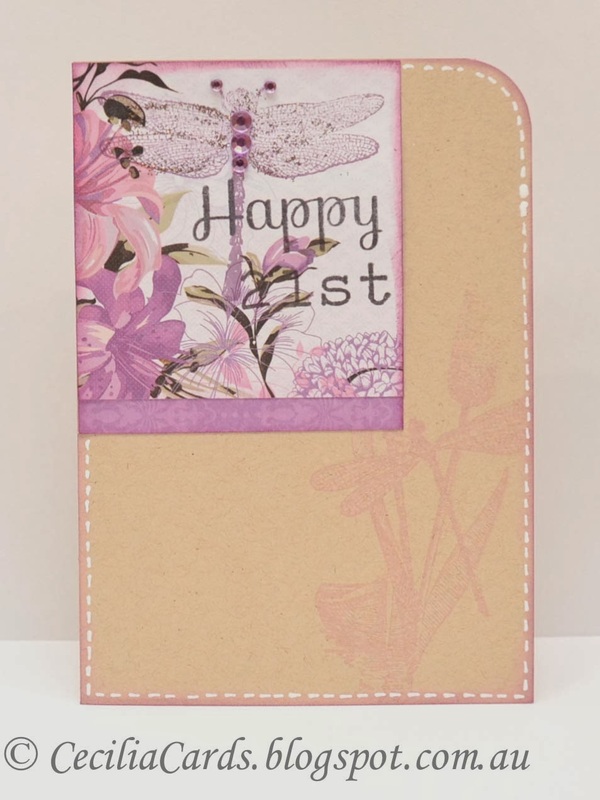 Well, it didn't take me long to find the perfect Kaisercraft collection for this - Violet Crush. 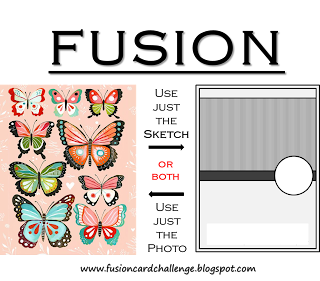 The rest was too easy, although I had to order some dragonfly stamps as I didn't have any. Here is the album and the matching card I made with this week's Retro Sketch. This album is on the way to Queensland right now, hope Taleah likes it! Kaisercraft Numbers, Ranger Stickles, Kaisercraft rhinestones, Tim Holtz antique keys, Twine from The Twinery, MFT DieNamics Tall Alphabet Dies and silver metallic paint from Viva. I have a really huge baby card to share. This is a card made for a work colleague who is due in just under 5 weeks time. I'll take you through my thought processes for making this A4 card. 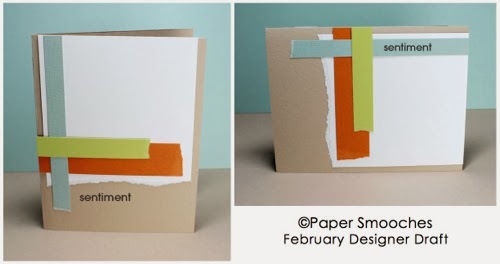 I folded a white cardstock and also a kraft one (I thought white will go better for a baby card). I then took out the first 6x6 pad I saw which is perfect for a baby card. I then tear off various patterned papers from the pad and started to group the solid colours together and the small patterned papers together. The obvious die of choice is of course my new Paper Smooches Onesie die .... but it looks so small on a big A4 card. Then I thought I could make a whole lot of different patterned Onesies and scatter them on the card.. so I cut out about 4 different patterns and spread them on the card... still looked too small. 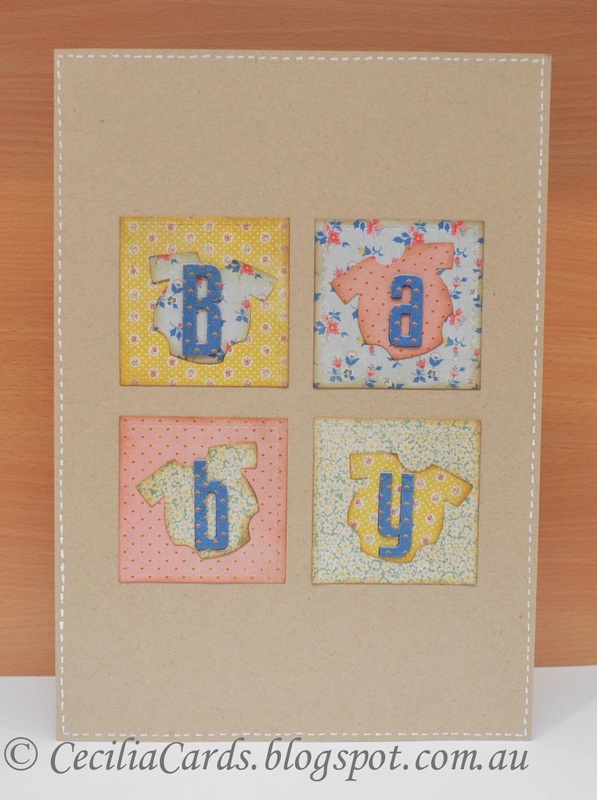 I then got the solid patterned paper and cut out 'Baby' and grouped the onesie vertically with an alphabet on each one. Still not right. Back to square one, and I pulled out the Lil Inkers stitched squares and cut out four (they look like baby blocks). The 'Baby' got cut again on PP with adhesive at the back and layered onto 2 layers of cardstock. 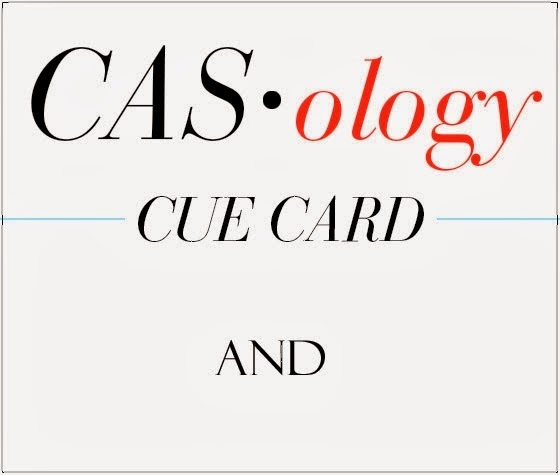 The result can be seen below (looked better on kraft than white card base).. And guess what? I have 3 more A4 cards to make for work colleagues leaving next week!! Neenah cardstock, Basic Grey Mint Julep, Papersmooches Onesie die, MFT DieNamics tall alphabets, Lil Inkers Stitched squares, Tim Holtz Gathered Twigs, white gel pen. It feels so go to craft again after nearly 4 weeks off! 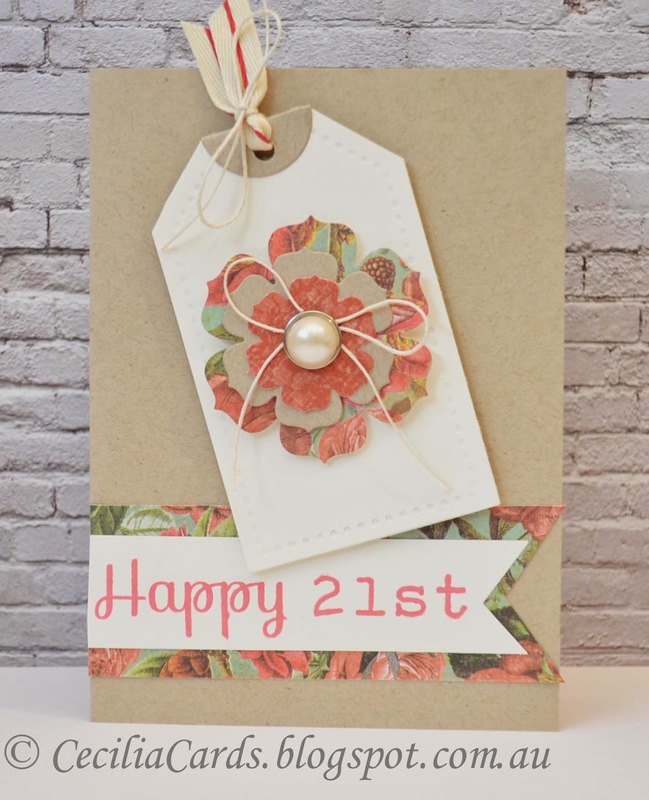 I have a 21st birthday card to share using my favourite cardstock! I'm adding this to Simon Says Stamp's Wednesday challenge - Get Krafty! 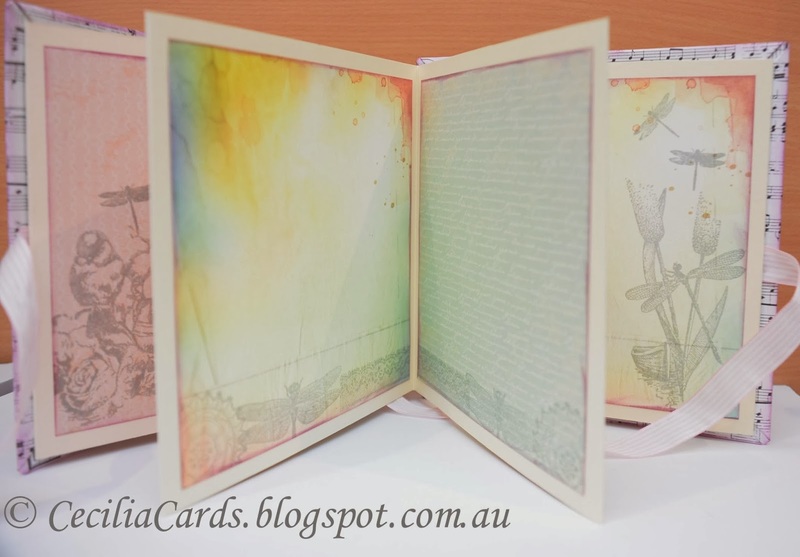 The card went with an order for another 21st album I made for a client (on the way to NSW right now).. Thanks for dropping by! Neenah cardstock, PTI Sale Tag and Blossms dies, Kaisercraft Porcerlain Rose 6x6, Simon Says Stamp Happy Stampset, Hero Arts Alphabets stampset and Red Tomato, Ranger Archival Jet Black, Kaisercraft pearl, Hemptique hemp and ribbon. 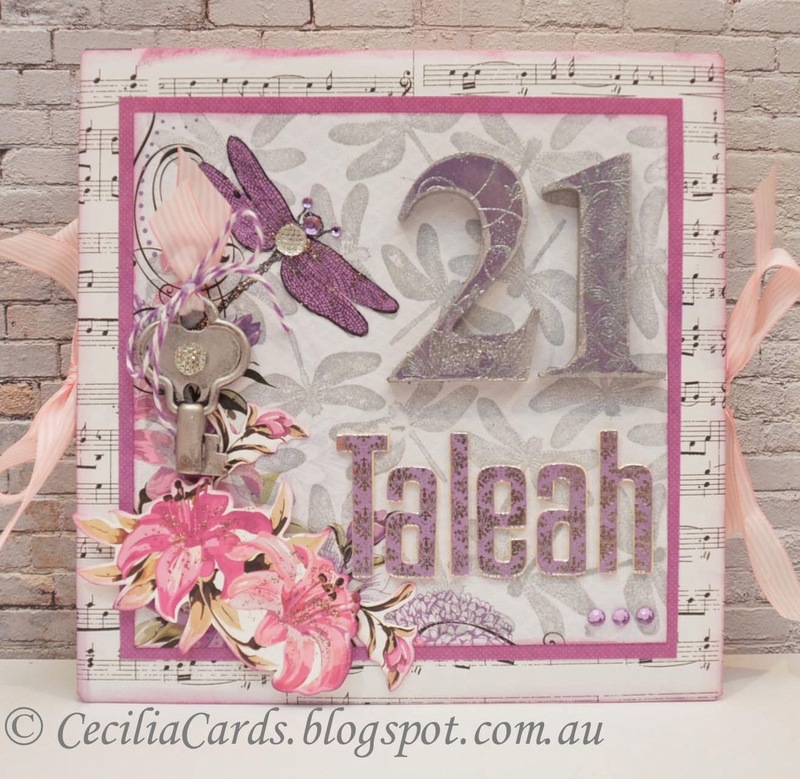 Canson cardstock, Kaisercraft Porcelain Rose 6x6, Recollections, Kaisercraft numbers, MFT DieNamics Tall Alphabet dies, Hero Arts Antique Flowers and Butterflies, Leafy Vines and Classic Tea Rose, Maya Road Antique Skeleton key, Kaisercraft pearls, lace, ribbon, Hemp. I have a couple of Valentine's Day cards to share. One is for my beloved and the other for a Flickr card exchange. These cards are not for any particular challenges, it feels so good to be back in the craft room again! 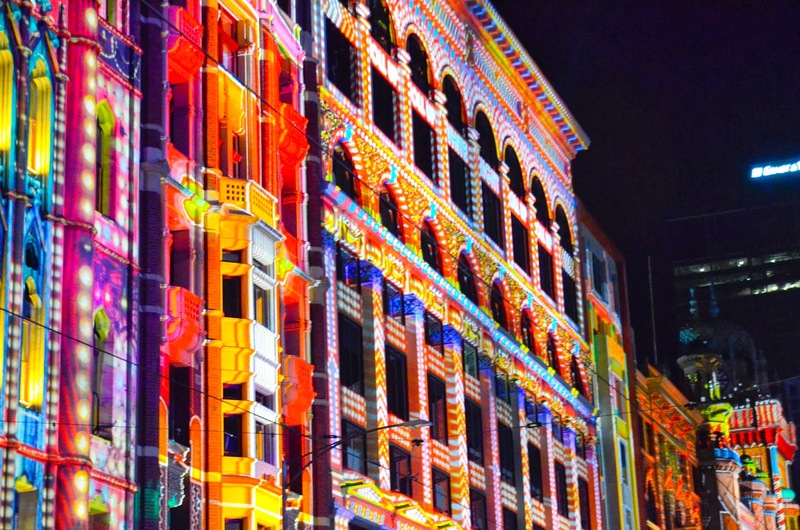 I've been overseas and when I came back I was very busy with Chinese New Year activities. Nearly over now, so back to the norm again! Happy Valentine's Day everyone!! I've decided to add the first card to the WPlus9 Birthday Celebration - Step It Up Challenge. Neenah card stock, WPlus Feathers, Hero Arts CL498, Soft Granite, Pool and Wet Cement, PTI Happy die. 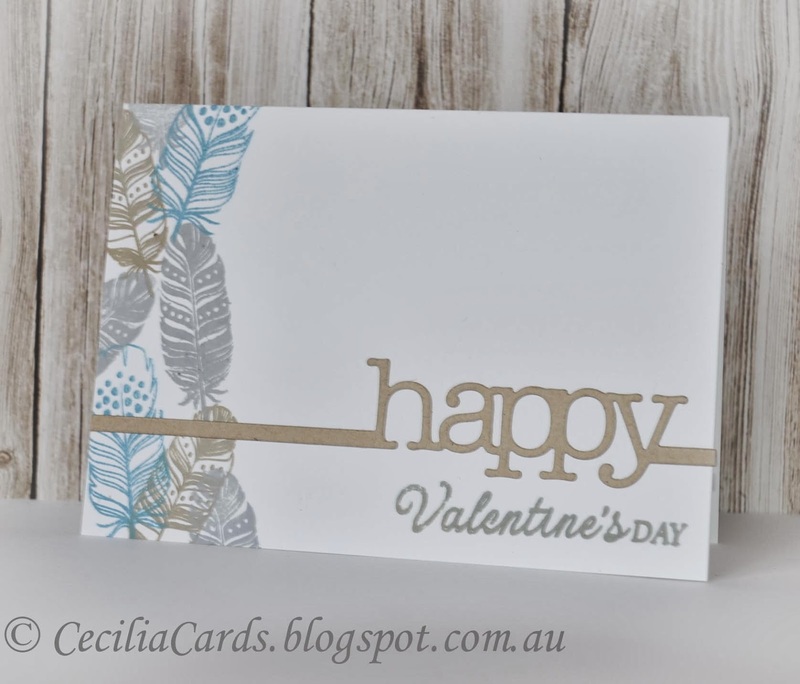 Neenah cardstock, Basic Grey True Love, Hero Arts CL498, PTI Fourish, MFT DieNamics Tall Alphabet Dies. This card is an order for a friend's wedding. The only specification was that the sentiment had to be 'To our daughter and son-in-law'. I printed the sentiment on card stock and die cut with the SSS folded banner. 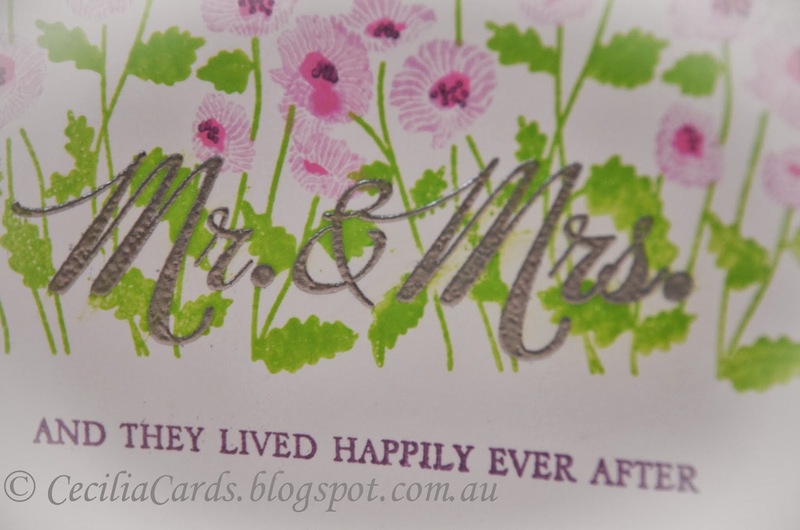 I used heavy card stock for the embossing before adhering onto the folded square card. 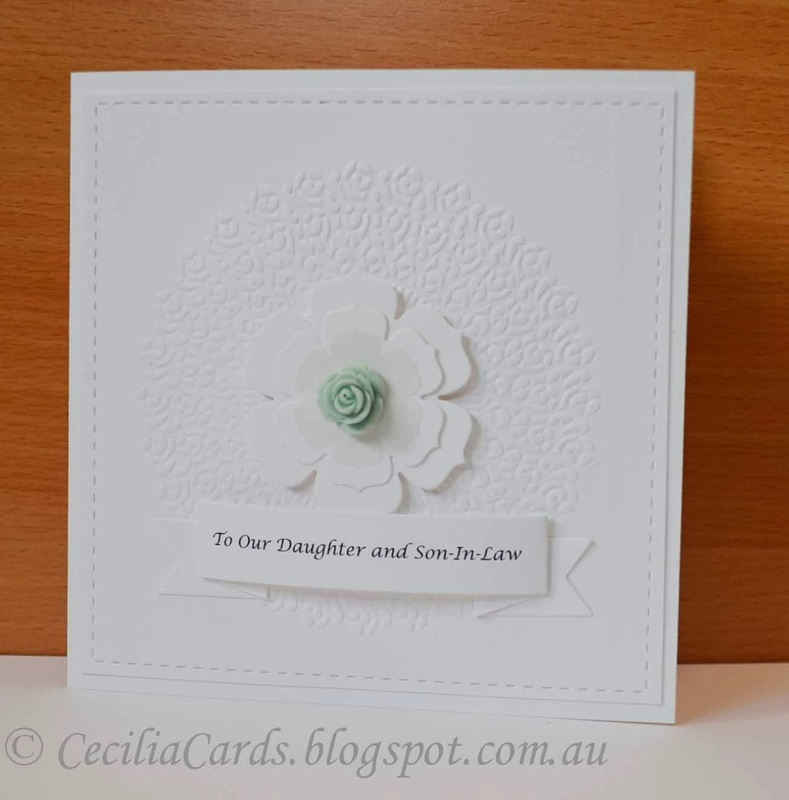 The flower was cut with the normal card stock and heavy weight vellum and adhered onto the embossed background with dimensional foam. The theme of the wedding is turquoise, so I decided to added a little resin flower in the middle. The folded banner at the bottom of the card finished it all very nicely! My friend was very happy with the card, hope her daughter and son-in-law like it too! Neenah Solar White, Vellum, Lil Inkers Stitched Squares, Sizzix Hero Arts medallion EF, PTI Bloom die, SSS Folded Banner, Kaisercraft Blossom.